I've been intending to do this for over a year, and finally got the courage to do it over the last week. I replaced the waistband in my Sweet Legs Plus leggings I bought last fall (I think they were called Dark Night Plus). I've googled on this one and I think I must be the only person who things the waistband on the Sweet Legs Leggings Plus is too tight. The rest of the leggings fit great with lots of room to spare, but that waist band! Argh! Because of this, I never wear them. I have 3 pairs, and I've worn 1 pair once. I pulled my least favourite pair out of the drawer, grabbed my seam ripper, and seam ripped the stitches that held down the waistband (cover stitched originally), then seam ripped the stitches that attached the waistband to the pants (serged originally). I had to be really careful not to catch any of the fabric, but it went well, and I ended up with the elastic coming out intact enough I'll be able to reuse it for some pj pants for one of the kids. I then measured the length of elastic I wanted to use to be comfortable. I just used the 1" braided elastic you can get from Walmart. I think it was less than $2 for the length and I can easily get 2 waistbands for myself plus at least 1 for the kids out of one package. I want to try cotton swimwear elastic, but I'd have to order that online, so I haven't yet. I used to be an hourglass before I had the kids, but I'm definitely more of an apple now. Needless to say, I was weary of using elastic in my waistband at all, but because I'm not an hourglass, my best shot of having my pants stay up is with some sort of elastic (or so I've heard). It's about as loose as it could possibly be too, so it's pretty comfy. I cut the elastic to length, and sewed it up using my regular sewing machine and a zigzag stitch. I placed a scrap square of fabric under the 2 ends and sewed over that too (trimming the sides off after sewing). It worked well! My zigzag settings for sewing the elastic together were 2.25mm width and 0.5mm length. I'm a chicken, so I zigzagged over 2 times and back-stitched on each end. I quartered the elastic and the pants (separately, with ball point pins) and pinned them together at those quarter marks (on the wrong side / inside of the leggings). Using my 3 thread narrow stitch on my serger (I love LOVE LOVE my Juki 654DE), I attached the edge of the elastic to the inside edge of the pants, and was super careful not to nick the elastic. I contemplated sewing with my blade disengaged, but wanted to get any pesky bits of leggings fabric that was sticking past the elastic, so I left it engaged. I then folded the elastic down one time to hide it, but still leave that serged edge exposed. I contemplated rolling it down once more, but tried it on like that and it fit better just being folded down once. After folding the elastic down, I quartered it again and pinned those quarters down. I love pins. I went back to my regular sewing machine and used my 3 step zigzag (5mm width, 1mm length) to sew down the elastic and hide it from sight. I sewed with the wrong side facing me and kept the zigzag as close to the serged edge as I could. I think it came out pretty well! The leggings are now super comfy and I have pulled out my other two pairs to seam rip tonight. I took note of the length of waist elastic I found comfy and will easily be able to replicate this alteration on future pairs. I'm particularly excited because I'm in time to order a few pairs of holiday Sweet Legs and have them altered in time for winter! I've also drafted a leggings pattern from the sewhere.com Made to Measure leggings class and I'm excited to start cutting and sewing some super custom leggings for myself in the next little while. 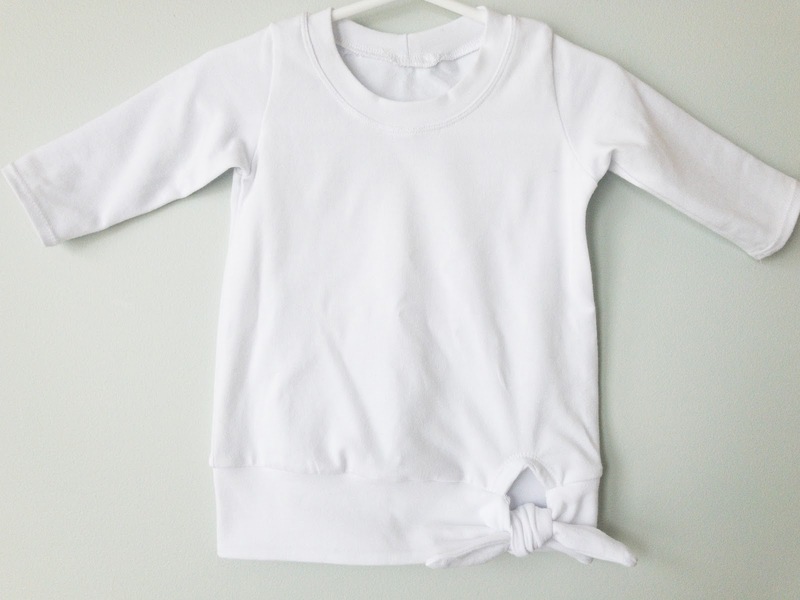 I decided that my almost 2 year old needed a t-shirt out of the leftover fabric from my Concord T-Shirt by Cashmerette (which I may or may not have blogged already depending on when I publish this). 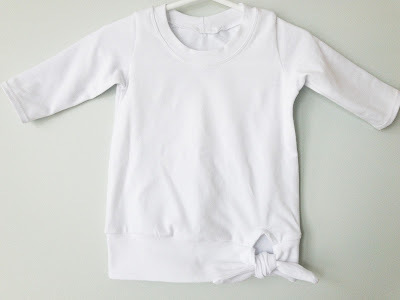 I bought 2 meters of white cotton/spandex (95% cotton / 5% spandex) and had about 0.5 meters leftover after I finished my Concord, and fairly quickly realized that I was going to be able to make more than 1 toddler shirt out of the leftovers. While Patterns for Pirates was having a 30% off sale (it's over now), I snapped up the Fav Tee, which is the girls version. I had originally planned to get the bundle with the women's t-shirt as well, but I am so happy with the fit of the Concord, I didn't really feel the need to. E's measurements put her in the 9 month size...she's going to be 2 in two weeks...and wears an 18 - 24 month size is basically all the kids brands out there (Carters/Oshkosh, Old Navy, Children's Place, etc). Definitely go by your kid's measurements, because the 9 month size actually fits her. This t-shirt pattern has lots of options...wait, can I just take a minute to sing the praises of Patterns for Pirates for using layers in their pdf's? It makes it so easy to print the size, or two/three (if you're grading), and not have a bunch of extra lines to ignore. The no trim pages are also just fantastic. No words. Amazing. Heavens opening, angels singing, annoyance free pdf pattern printing. Just the best. Ok, so back to the options...I chose to make the 3/4 length sleeve, scoop neck, tie bottom version. The tie bottom takes a fair amount of fabric, but it is so cute, I think it's worth it. I'm also looking forward to trying the contrasting tie bottom at some point. For the first shirt, I did basically all the assembly on the serger, with just hemming the cuffs and top stitching the neck band on my sewing machine with a double needle (first time using one of these and it's pretty cool!). With the double needle, I found I got the best results with my stitch length at nearly 4mm and the upper thread tension at 3. The twin needle I bought was a Shmetz, 2.5mm Stretch Twin Needle. I kind of regret (just a little) not buying the slightly wider twin needle. I also sewed in clear elastic to the shoulder seams, which was something I did for the first time on my Concord T-Shirt, and I figured it'd carry over to this shirt (it did). I'm hemming the cuffs with the (double needle) before seaming the sleeve. These sleeves are tiny and a huge struggle on my sewing machine no matter how I manipulate the fabric. I sewed the tie band pieces together on the serger the first time, and for the second shirt I've zigzagged this seam (1.5mm long / 2.5mm wide). It gave my much more control and less bulk in the points. I'll still attach the band to the shirt with the serger though. I'll be sewing the tie front opening facing on the sewing machine this time. It's just too fiddly and tiny to get it to work well on the serger. It was not fun to stitch it on the serger the first time and the edge isn't exposed in the end, so I'm fine zigzagging this part too. That's it! Not to many changes for the second one. All in all, I managed to cut 2 of the tie band shirts and one non-tie band shirt out of 0.5 meters.